This was rather non-trivial. 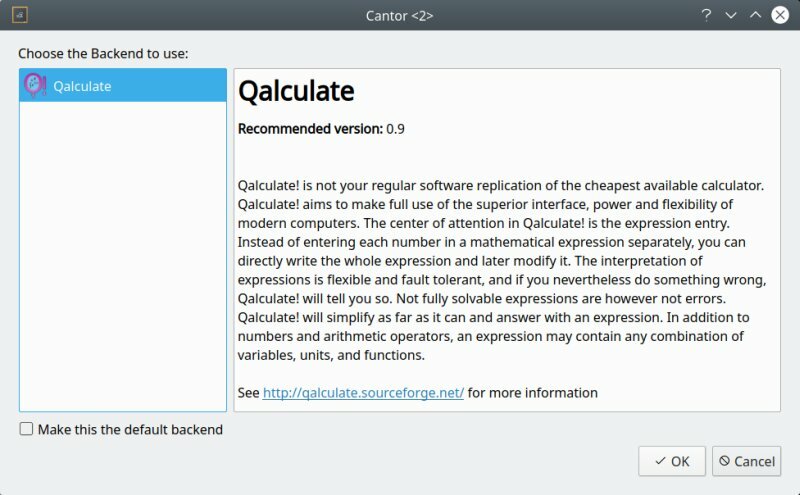 I installed Cantor, and then launched it, and it only had Qalculate in the list. I played with the settings, trying to find a way to add other programs. 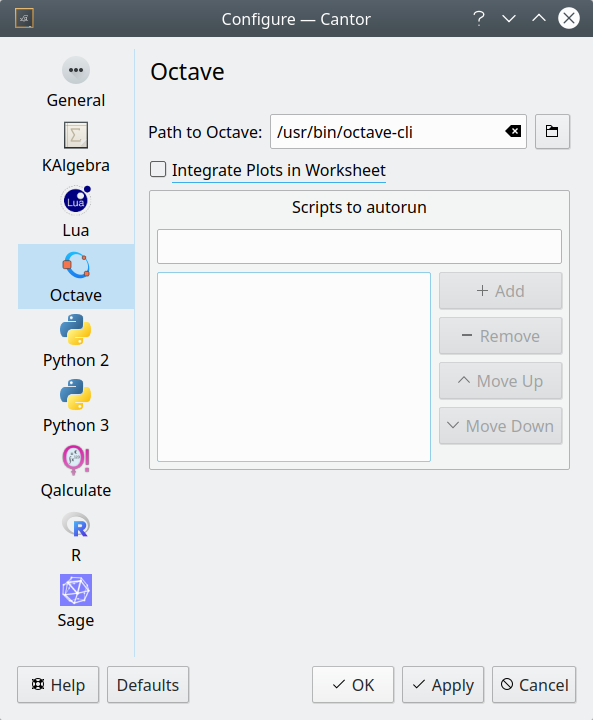 I had Octave and Scilab in mind, to start with, but there didn't seem to be an integral way to include them. Trying to make progress, I did install Octave manually, but this didn't change a thing. 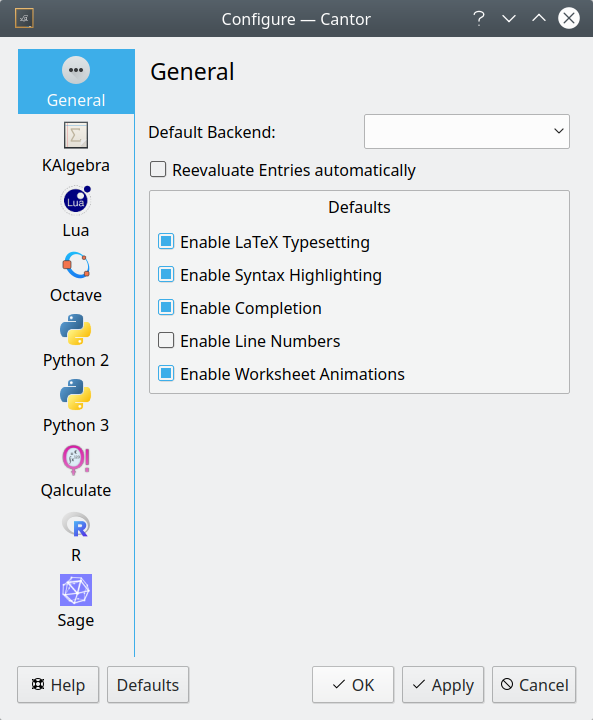 After some fiddling, I finally realized that the functionality is actually provided by additional backends, which you need to install - much like any other software package. Once I had these on the system, the other programs did show in the Cantor's interface. But even now, there was a discrepancy - now all of them were shown. Another less known fact; Cantor will display only those that actually have some sort of interface. Indeed, you can verify this through the settings, where the remaining math engines were showing up. 'Tis all a bit confusing, and it could be made easier and simpler. Like a button that says "Add more engines" or whatnot. Eventually, I had Octave running. I've reviewed this excellent program quite a few times before. It's also almost identical to Matlab, which makes it extremely useful - and makes most sense to my physics-wired brain. Working with matrices is the way it should be done. I did struggle a little in the beginning. Being slightly rusty with Octave, it took me a little bit of time remembering some of the details, most notably how to install and import packages. I wanted to create several fancy 3D shapes (like Torus), but this is part of the geometry package, which you need to install separately. In the end, I was making progress, but then Octave, on its own, seemed to be doing a better job. 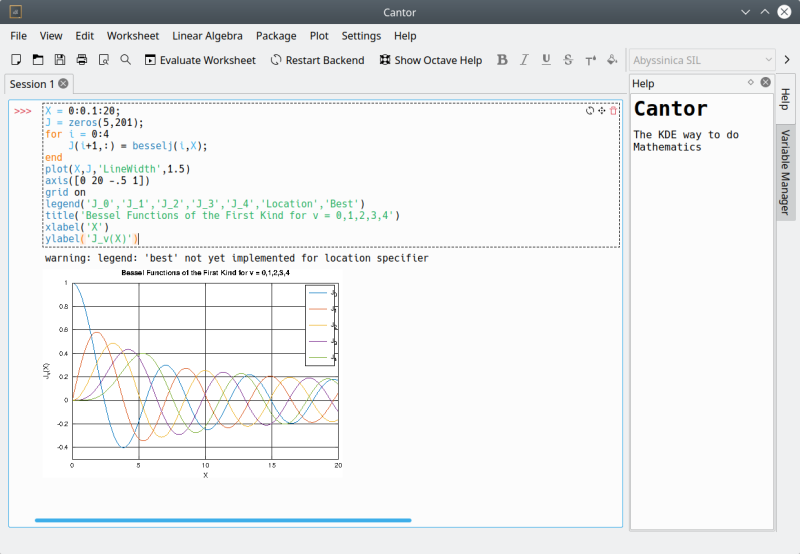 I started making graphs of all sorts, to see how practical Cantor is. I didn't reuse my old code for this. 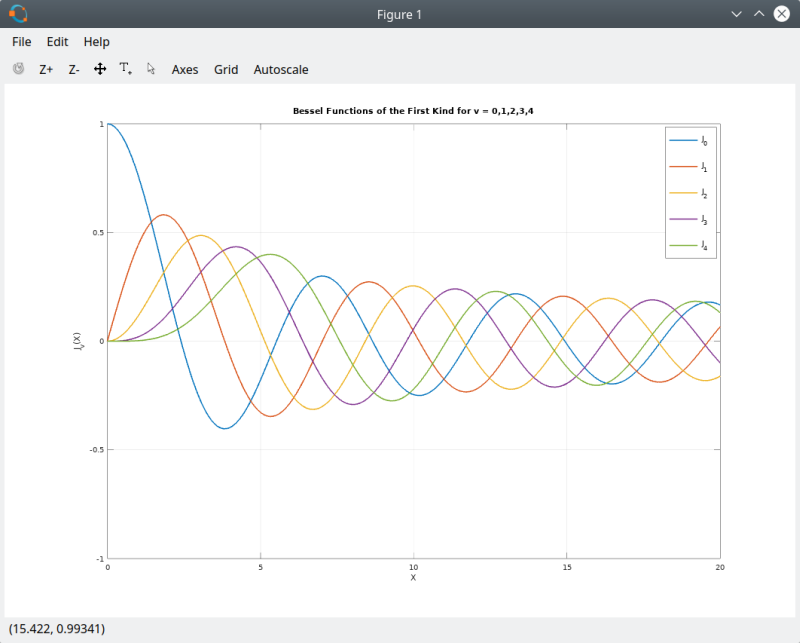 Instead, I used free Bessel rings examples from Matlab and Octave help pages. I did this in Octave and Cantor side by side, to see the differences in speed, syntax and quality of created figures. 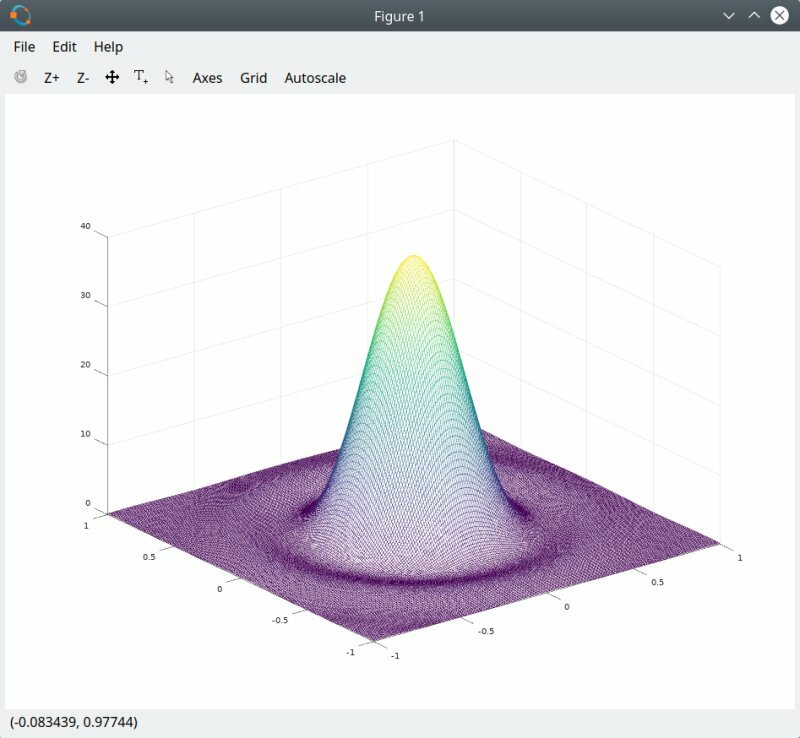 Overall, the figures and images were much nicer in Octave. One, faster and smoother rendering. Two, images auto-resize, and you don't lose any quality. Three, the system was rather quiet when doing all this, and the results were near-instantaneous. In Cantor, the same actions resulted in huge memory footprint, my CPU fans were shrieking like crazy, and the final figures were all scrunched. I was able to zoom in, but then they looked all fuzzy and blurred. 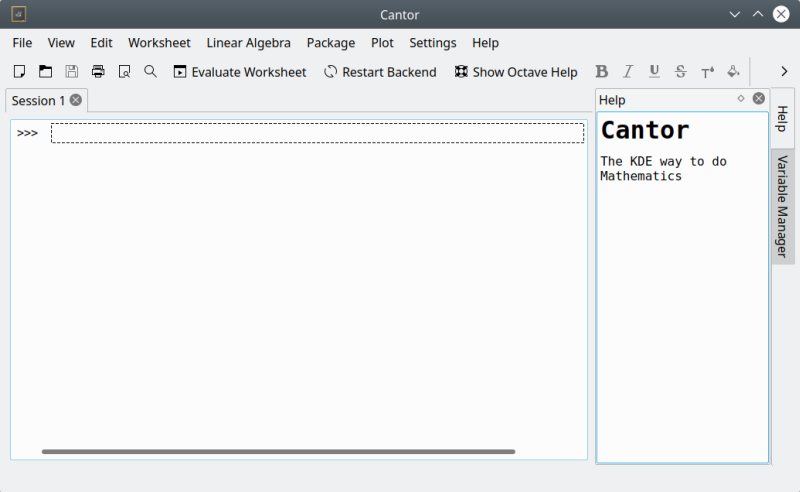 Another issue is that by default, Cantor inlines images, so they are created in the workspace area. This looks quite bad, and you need to scroll horizontally to find your images - if you realize this is what you need to do in the first place. Jittery behavior, on top of that. I did change the settings to pop the figures out, and this did help a little bit, but I wasn't able to resize them. The figures would just freeze and become non-responsive, and I had to kill Cantor a few times. Meanwhile, the CPU fans would scream and the memory footprint would soar, and even with 16 GB of RAM on my Slimbook, I hit the swap space, w00t! 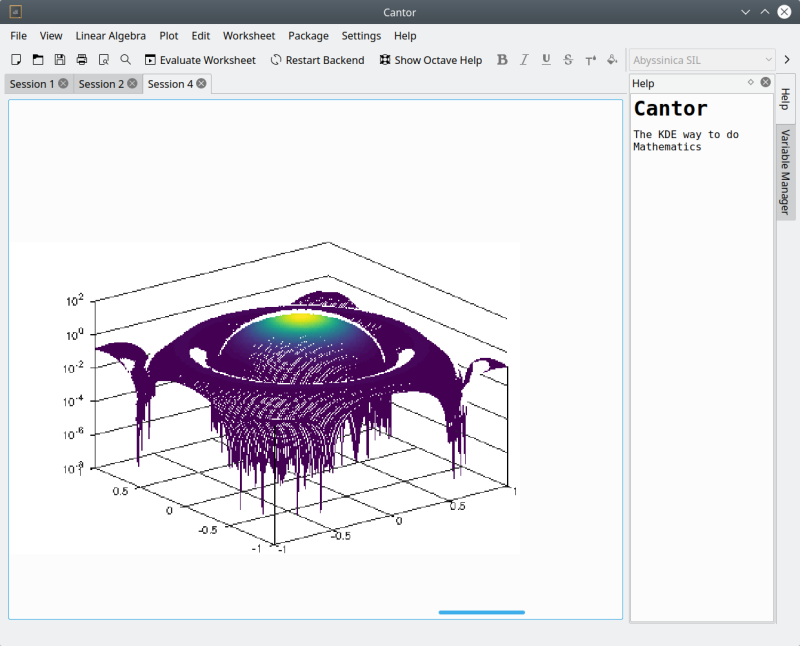 The figure is displayed inline in Cantor, the graph looks blurry, and it's hard to navigate. CPU, memory usage was really high when running Octave through Cantor. Figures are much nicer and smoother in Octave (natively). I was able to use colormaps just fine - so if Octave supports it, Cantor will support it, and I guess the same logic extends to all other backends. 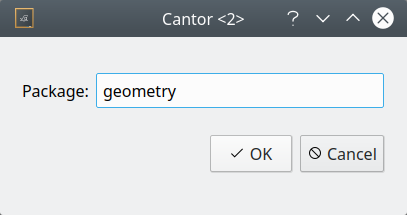 This means you don't need to doubt whatever Cantor is doing, you just need to make sure you have the right packages installed. Alas, this does not help much; the figure would not resize, the menu is hidden, the UI is frozen. Cantor does give you detailed menu options. 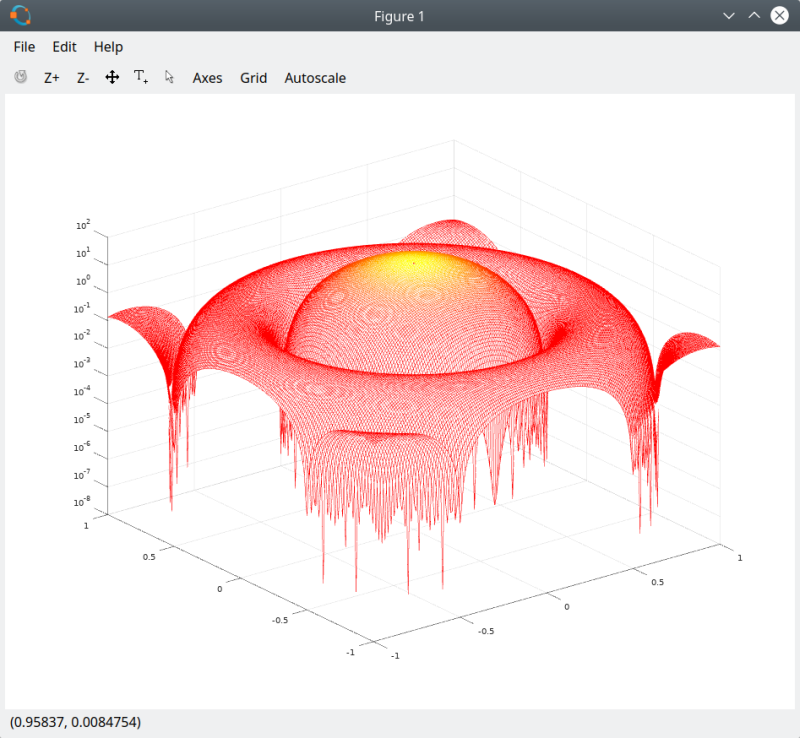 You can import packages, create 2D and 3D plots, show relevant backend help, and more. Quite useful in this regard, and the guided wizards can be helpful to people who are not too familiar with the syntax. This is doubly useful if you work with multiple backends, so you only need to know what you want to get, and Cantor will handle the translation. Cushty. Now, in addition to the many usability issues when running Cantor, there are also some aesthetic ones. For example, the main interface feels wrong. It's completely empty save for a few buttons, so I wonder what the original design was, and why it wasn't implemented. Now, you get the backend prompt, and then the tool switches to the relevant engine, so the main interface isn't really necessary. 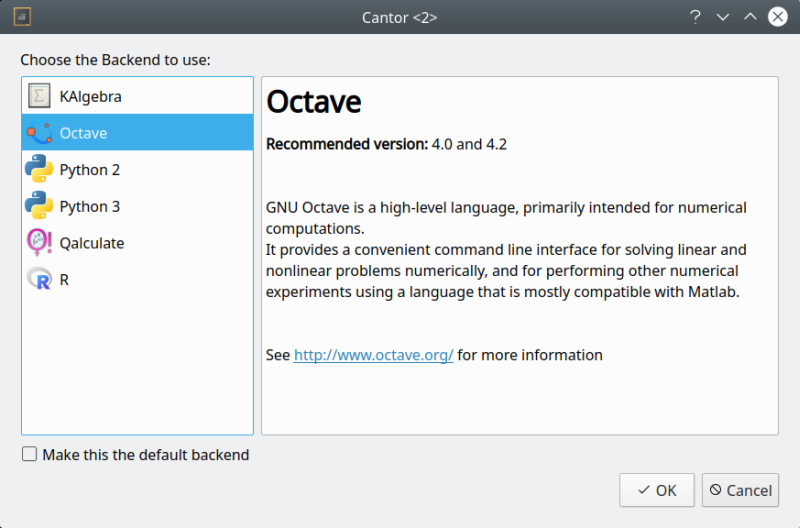 There were a few niggles here and there, and maybe one or two commands didn't really work in Cantor, compared to Octave. Overall, the interface was also much slower, and it was a pain getting the workspace terminal or whatever it's called to respond. And copy & paste functionality is quite weird. 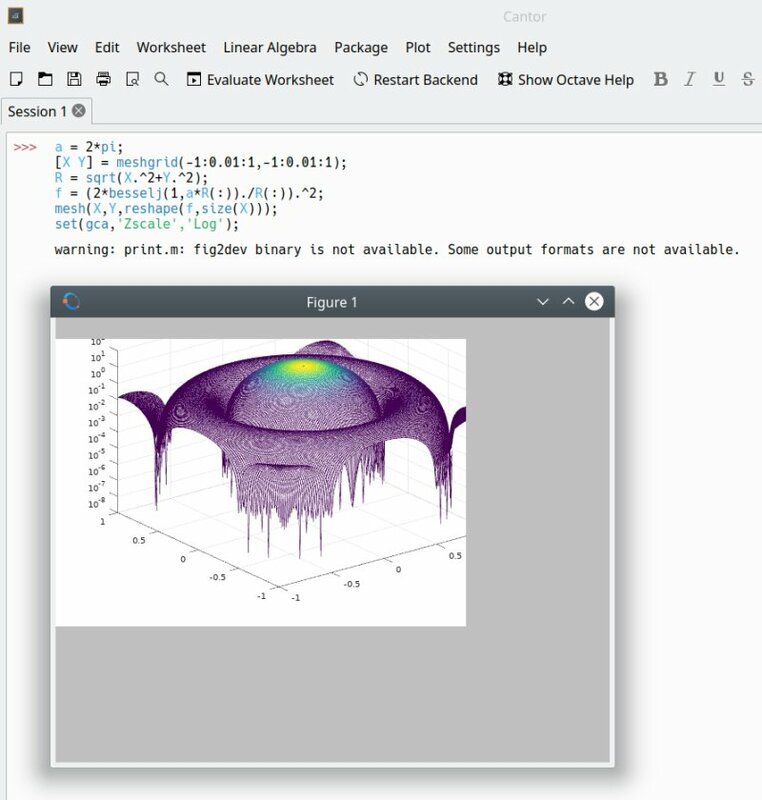 If you grab Matlab code from the web and paste it in Octave, there's almost 100% chance it will be shown line by line and work well. If you copy code from Cantor, the newline characters will be mangled, so it will all be displayed as a single line, and Octave would not really be able to validate it.